We all wanted it, but only one of us had the guts to actually commit murder. Three of us hid inside, either openly, or passive-aggressively denying that lives were being taken just outside the door - leaving only Gloria to push them to their boiling deaths. She alone could stomach their cries for mercy. It was party time for the Newfy Gals in Nova Scotia and lobsters were being sacrificed in honor of our visit. We LOVE Nova Scotia and it has welcomed us with warmth! Even the stunning visitors center welcomed Arayo inside and at least 6 employees rushed over to greet Arayo, while others surrounded her and lavished her with pets and praise. 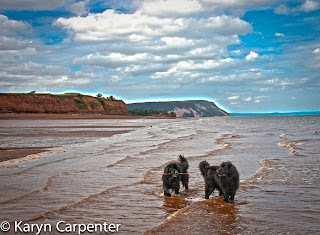 What a life for a newf! 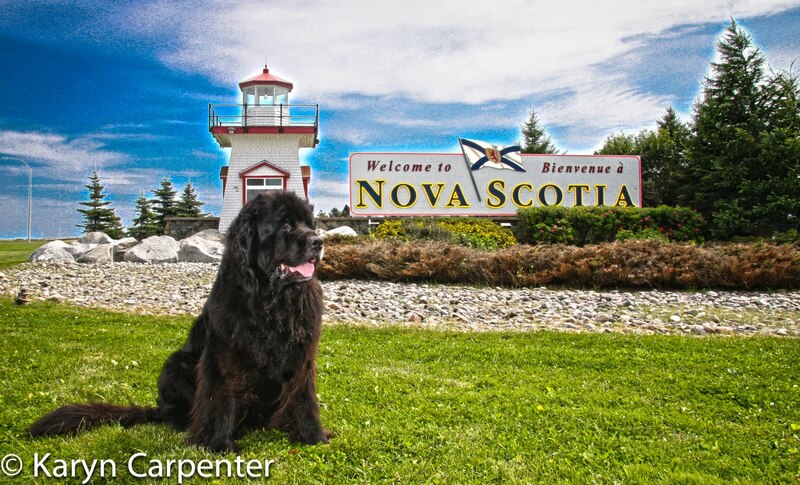 Photos: Aryao poses with yet another border sign - this one welcoming visitors to Nova Scotia. 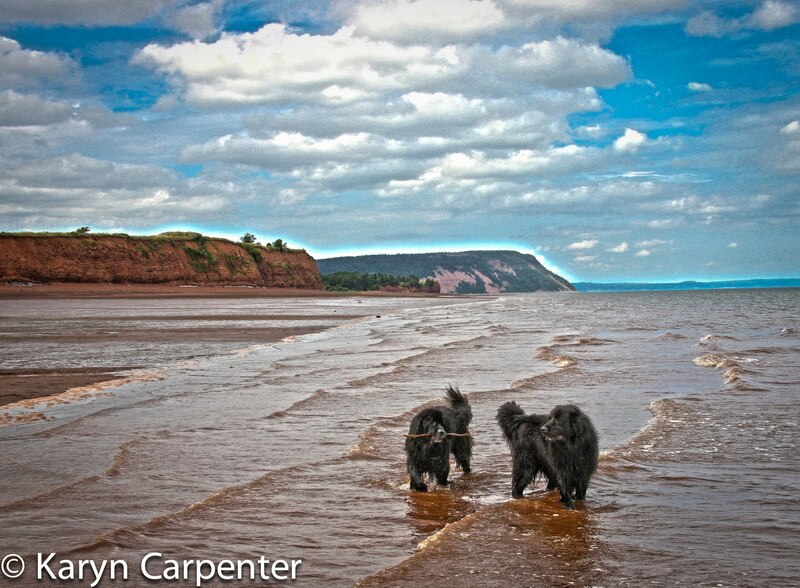 Arayo and near new pal Gracie play in the water with the beautiful backdrop of Cape Blomidon. I've spent many an evening on the beaches of Nova Scotia eating lobster just off the boats and baked in pits. Nothing ever tasted so good! Hurray for Nova Scotia.... Someday I want to go there. I had some ancestors from New Brunswick and Nova Scotia. Jennie with Rufus and Malia... Newfies of the four legged sort. In a similar vein, I made a trek to ed obster (the R and L were burned out) this week for a birthday dinner. My friends would not even go look at the "poor lobsters" in the watery cell awaiting their fate. They had no trouble drooling over the photos of the cooked, prepared lobster dinners on the colorful menus.